Aliases: Angmo II, Hero Protector, Lord Emperor, Prince of Sakaar, the Crown Prince of Sakaar, "your grace"
Powers/Abilities: Angmo-Asan was, at least formerly, a brilliant military strategist. He was a highly skilled hand-to-hand combatant and swordsman. He retained some of these skills while he was Emperor, though he tended to rely on his armor in battle (or to send Caiera, the Death's Head Warguard, Imperial Dreadnoughts, or the Imperial Guard). Even in his battle armor, he demonstrated remarkable agility, speed, dexterity and swordsmanship. He frequently wore a suit of armor formerly worn by his father, fashioned from the body of the first Death's Head unit permanently deactivated by Angmo I. The suit increased his strength, speed, and durability to unspecified superhuman levels (perhaps Class 10-25 strength); it could further generate a protective force field of undetermined limitations. 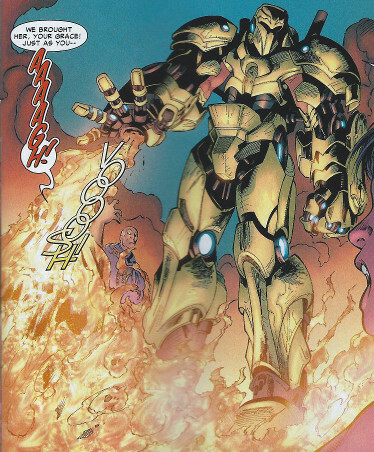 The armor could also fire flame and missiles from its palms and wrists, respectively. It also allowed him to, at least, hover in the air. His favored weapon was his flame sword, with which he could incinerate a non-powered human-sized figure. The blade was durable enough to slice the Hulk's flesh. His cyborg form may have had abilities comparable to those of his armored normal form, but he didn't demonstrate its abilities often. Apparently a(n) heroic figure in his youth, he was willing to kill his father to succeed him as emperor, and he proved willing and able to sacrifice anyone and anything to maintain his powers and achieve his goals. He cared little for others, only himself. After being rebuilt by the Wildebots, he gained a new appreciation for life and became a protector again. Height: (Armored/cyborg) approximately 7'6"; (organic) 5'10"
Weight: (Armored/cyborg) approximately 1200 lbs. ; (organic) 166 lbs. (Planet Hulk: Gladiator Guidebook#1: The Imperials: The Emperor - BTS) <519 post> - Angmo-Asan was born in Geot City, as the Spikes had already captured the First Imperial Capital City four years prior. (WWH Aftersmash: Warbound#2: Tales of the Warbound (fb) - BTS) - Angmo-Asan was taken to the walled city of An Sara, perhaps by his mother to protect him from his father, Angmo I the Father Emperor of the Imperials. (WWH Aftersmash: Warbound#2: Tales of the Warbound (fb)) - Angmo I gave Hiroim one more task, to travel to An Sara and slay Angmo II (who was hidden there), whom Angmo I proclaimed to be the the greatest threat to peace Sakaar had ever known. (Planet Hulk: Gladiator Guidebook#1: The Great Games: Hiroim -- Shadow Person / WWH Aftersmash: Warbound#2: Tales of the Warbound (fb)) - Hiroim made the trip to An Sara, but could not murder the young (perhaps a few years old) prince. Instead, Hiroim broke his bond to Angmo I and went into seclusion, hated by his people and hunted by the Empire for his betrayal. Hiroim wandered the deserts thusly for 20 years, until Angmo I's death. (Planet Hulk: Gladiator Guidebook#1: The Imperials: The Emperor - BTS) - Returning to Geot City at some point, Angmo-Asan, the Crown Prince led a relatively pampered life, attending Tego's Secondary Forums and consistently yearning to enter the battle against the Spikes. (Planet Hulk: Gladiator Guidebook#1: The Imperials: The Emperor - BTS) - Upon reaching the age of 16, the impetuous young Angmo-Asan ran away from home, ordering a young team of Imperial Guard trainees to accompany him on a mission to destroy the Spikes. Their adventures took them to the outskirts of the Great Desert. (Planet Hulk: Gladiator Guidebook#1: The Shadow People: The Lieutenant (fb) - BTS / Incredible Hulk II#98 (fb)) <533 Post; see comments> - Seeking to enslave one of the Shadow People with the Old Power, Angmo-Asan led a trio of Death's Head Warguards to monitor a Spike attack on her tribe (perhaps they even guided the Spikes to assault the tribe). Once the rest of the tribe had been slain by the Spikes, Angmo instructed the Warguard to destroy the Spikes with fiery weapons. He then then had the Death's Heads implant an obedience disk on Caiera, after which she was taken into Imperial custody and entered Angmo's service. (Planet Hulk: Gladiator Guidebook#1: The Imperials: The Emperor - BTS) - As the Crown Prince and his young troops ventured across Sakaar slaying Spikes, Angmo-Asan became known as the Empire's Hero Protector. (Planet Hulk: Gladiator Guidebook#1: The Imperials: The Emperor / Planet Hulk: Gladiator Guidebook#1: The Shadow People: History, Culture & Society (fb) - BTS / Skaar: Son of Hulk Presents – Savage World of Sakaar#1 (fb) - BTS) <32 years before the main story; see comments> - Agnmo-Asan signed the Shadow Treaty, making Caiera his Warbound servant, bound by an oath of her people to serve him. With it no longer needed, Angmo-Asan had her obedience disc removed. (Skaar: Son of Hulk Presents – Savage World of Sakaar#1 (fb) - BTS) - Angmo-Asan allied with the powerful Axeman Bone to slay his father, Angmo I, the Father Emperor. Planet Hulk: Gladiator Guidebook#1: The Imperials: History, Culture & Society (fb) - BTS / Skaar: Son of Hulk Presents – Savage World of Sakaar#1 (fb)) <552 Post> - While Angmo I was hunting in the plains of Upper Vandro alongside some of his soldiers, Axeman Bone attacked and slew him. (Planet Hulk: Gladiator Guidebook#1: The Imperials: History, Culture & Society (fb) - BTS / WWH Aftersmash: Warbound#2: Tales of the Warbound (fb)) - Angmo-Asan, Sakaar's Hero Protector, claimed the crown over his father's corpse. He assumed the throne, adopting the alias of the Red King. (Planet Hulk: Gladiator Guidebook#1: The Great Games - BTS) - The Red King claimed the Emperor's private metal open-air skybox in the first level of the Great Arena. 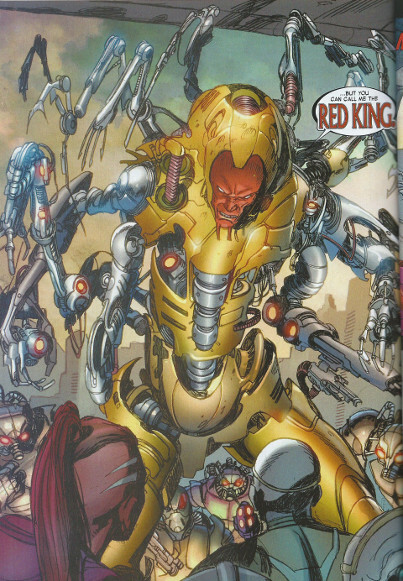 (Planet Hulk: Gladiator Guidebook#1: Imperial Technology: Death's Head Unit - BTS) - The Red King recalled many of the Death's Head units to Crown City to serve as the Red King's personal protectors. (Skaar: Son of Hulk#6 (fb)) - The Red King had the Death's Heads slaughter any who opposed him. (Planet Hulk: Gladiator Guidebook#1: The Imperials: The Emperor - BTS) - The Red King's ruling style was criticized by rebels and other malcontents. (Planet Hulk: Gladiator Guidebook#1: The Natives: History, Culture, & Society - BTS) - The Red King began implementing new policies that some critics claimed were secretly designed to lead to the gradual genocide of the Native population. (Incredible Hulk III#97??? (fb) / 102 (fb) - BTS) - Under orders from the Red King, Imperial soldiers slew Miek's father, a king, and his hive. (Planet Hulk: Gladiator Guidebook#1: The Imperials: History, Culture & Society - BTS) - The Red King frequently sought the approval of the Senators (many of whom were close acquaintances) to give his policies a greater sense of legitimacy. In practice, he rarely heard any dissent from the Senate, as most Senators were his political cronies or wealthy oligarchs who remained largely unaffected by the vast majority of his policies, which tended to have a more disproportionate negative impact on the lower classes. (Skaar: Son of Hulk#3/2 (fb) - BTS) <10 years before the main story> - Axeman Bone was the Empire's greatest general, having united the six kingdoms and brought peace to Sakaar for the first time in centuries. (Skaar: Son of Hulk#3/2 (fb)) - The Warlords gave Bone their golden crownlets because none of them could beat him, and Bone gave the crownlets to the Red King. (Skaar: Son of Hulk#3/2 (fb) - BTS) - Nonetheless disatisfied, allegedly because he also could not defeat Bone, the Red King started a war with the barbarians and sent Bone to Fillia to fight it. Young and naive enough to believe in the honor that came from serving one's king, Bone slew every bearded savage he found. (Skaar: Son of Hulk#3/2 (fb)) - With Bone away, the Red King and his Death's Head Warguard killed the six kings, every lieutenant Bone had left behind, and every prince who carried his blood. Only the Red King's daughter Omaka survived (though she lost both arms in the process) an assault that killed her infant brother and her mother. 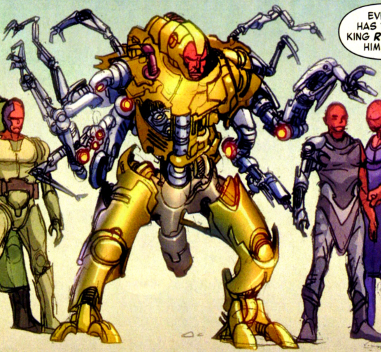 (Planet Hulk: Gladiator Guidebook#1: Sakaar: Wildebots - BTS) - Though the Empire had previously provided protection from wildebot attacks, the Red King decreed that wildebots were a local problem best resolved by local authorities rather than a responsibility of the federal military. (Planet Hulk: Gladiator Guidebook#1: The Imperials: Ronan Kaifi - BTS) - Ronan Kaifi at some point concluded that the Empire's increasing greed was causing it to neglect its subjects. After his pleas for the Empire to protect its constituents against the increasinly frequent wildebot attacks went unanswered, Ronan began to speak out publically against the Empire's greed and corruption, joining a growing movement of upper middle class Imperials who were opposed to the Red King's policies. (Planet Hulk: Gladiator Guidebook#1: The Imperials: Ronan Kaifi - BTS) - After several other critics of the Empire, such as Vesta Kaito and Emvo Kairee, were either killed or kidnapped, Ronan hired former Imperial Guard Captain Lavin Skee to serve as his bodyguard and retainer. (Planet Hulk: Gladiator Guidebook#1: Imperial Technology: Miscellaneous Technology: Viewboxes - BTS) - The Red King's public addresses were broadcast via Viewboxes developed from technology derived from materials from Matriculon that arrived on Sakaar via the Great Portal. (Planet Hulk: Gladiator Guidebook#1: The Imperials: Governor of Wukar - BTS) <558 Post> - Inheriting his father's role as Governor of Wukar, Denebo Aruc III became a loyal and subserviant follower of the Red King. He frequently patrolled Wukar in search of materials or beings having arrived through the Great Portal that he could present to the Red King to curry his favor. Denebo also enjoyed staging gladiatorial competitions in the Red King's honor. (Planet Hulk: Gladiator Guidebook#1: Sakaar: Geography: Independent Province of Fillia - BTS) - As relations between Fillia and the Empire had grown increasingly worse since the Spike War, the Red King suspected the Fillians of secretly plotting against him and harboring anti-Empire terrorists. (Planet Hulk: Gladiator Guidebook#1: Sakaar: Geography: Independent Province of Fillia - BTS / Planet Hulk: Gladiator Guidebook#1: Imperial Technology: Imperial Pleasure Cruiser - BTS) -) <560 post (see comments)> - One of seven Imperial Pleasure Cruisers was shot out of the sky near the Fillian city I'tjam, killing all on board. Despite eyewitnesses claiming to have seen wildebots fire at the cruiser, the Red King was convinced it was the group of Fillian rebels who shot it down. The Red King used the tragedy as an excuse to go to war against his own province, and the Fillians immediately declared their intention to leave the Empire and establish themselves as an independent city. (Skaar: Son of Hulk Presents – Savage World of Sakaar#1 (fb) - BTS) - The Red King was very popular with the Imperials for his war on Fillia. (Planet Hulk: Gladiator Guidebook#1: The Imperials: The Emperor - BTS) - The Red King increased standard provincial tributes to help fund his war. (Planet Hulk: Gladiator Guidebook#1: The Great Games: Kaifi, Elloe - BTS) - When tribute from Ronan Kaifi's constituents doubled, he addressed a series of petitions to the Red King, all of which were ignored. (Planet Hulk: Gladiator Guidebook#1: The Great Games: Kaifi, Elloe - BTS) - Investigating, Ronan Kaifi learned of the true extent of the neglect of his people by the Empire, leading him to begin talks with the growing rebel movement in Fillia. (Planet Hulk: Gladiator Guidebook#1: Imperial Technology: Imperial Dreadnoughts - BTS) - The newly constructed Imperial Dreadnoughts were extremely useful in the early days of the Red King's war against the Fillians, as the Fillians did not have an air vessel powerful enough to counter the massive Dreadnoughts. (Planet Hulk: Gladiator Guidebook#1: The Imperials: Governor of Wukar - BTS) - Aware of the fervent loyalty of the Governor of Wukar, the Red King often sent Denebo on missions outside of Wukar to serve as his personal representative; Denebo was often criticized as being the Red King's personal lapdog. 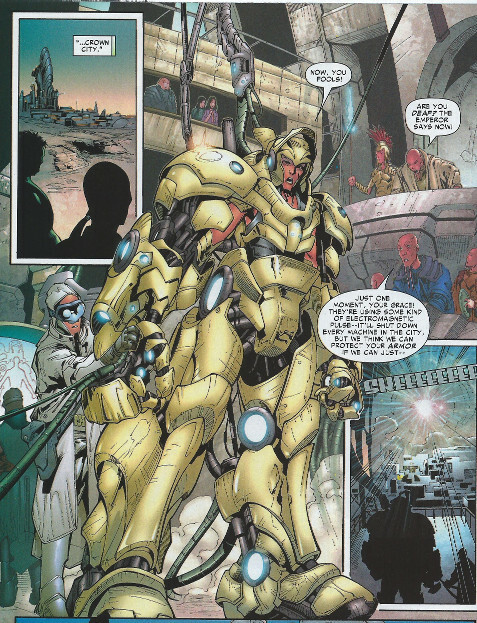 (Planet Hulk: Gladiator Guidebook#1: Imperial Technology: Death's Head Unit - BTS) - Growing increasingly suspicious of the traditional Imperial Guard, which he feared had been infiltrated by Fillian sympathizers, the Red King began phasing out the duties of the Guard and replacing them with Death's Head Units. (Planet Hulk: Gladiator Guidebook#1: The Imperials: History, Culture & Society - BTS) - The Red King thusly marginalized the role of the Imperial Guard, much to the dismay of many poor Imperial youths who had previously viewed enlistment in the guard as a way to climb the rigid Imperial social ladder; instead, they now saw the Great Games as their only avenue for improving their social standing. (Incredible Hulk III#102 (fb) - BTS) - At some point, Wildebots slew Hiroim (or another Shadow? )'s wife and children. (Planet Hulk: Gladiator Guidebook#1: The Imperials: Ronan Kaifi - BTS) - Ronan began secret meetings with rebel groups who planned to overthrow the Empire and continued to protest the recent increase in tribute necessitated by the war against the Fillians. (Skaar: Son of Hulk Presents – Savage World of Sakaar#1 (fb)) <7 years before the main story> - Wielding bionic arms, Omaka generated a force blast that shattered the Red King's drinking glass, and then she challenged Caiera to combat. Though Caiera suggested having the Death's Head snipers take her down, the Red King told Caiera that was far too clean, as the entire neighborhood knew she was coming; "Let's give the traitors the show they deserve." Caiera confronted Omaka telling her to surrender, and the Emperor might show her mercy. Omaka told Caiera not to try to hide her hate for the Red King, as she knew both his and Caiera's history. Wielding a control staff she had gained from her mother, Omaka offered to neutralize the control disc with which the Red King controlled her. Revealing the scar where the control disc had been, Caiera told Omaka she was 25 years too late, as the Red King removed her disc the day he signed the Shadow Treaty; now, she was instead bound to defend him by an oath to stand by the word of his people. Caiera next grabbed Omaka's left arm, place her hand on her sternum and hurled Omaka crashing into a building; applying the Old Power, Caiera then caused the building to collapse on Omaka. Watching from his chambers with a fresh glass of wine (or whatever), the Red King noted, "Beautiful." Omaka saved a hundred innocents from the rubble before her battle arms failed; a thousand others died that day. (Skaar: Son of Hulk#6 (fb) - BTS) - The Red King had his Warguard burn Omaka's village, including anyone she loved. (Planet Hulk: Gladiator Guidebook#1: Imperial Technology: Imperial Dreadnoughts - BTS) - After the Imperial Dreadnoughts obliterated several towns and cities along the southern Fillian border in a series of bombing campaigns, the Fillians developed an anti-aircraft defense system that prevented the Dreadnoughts from flying too deep into Fillian territory. (Planet Hulk: Gladiator Guidebook#1: Sakaar: Geography: Independent Province of Fillia - BTS) - The ground battle between the Empire and the Fillians reached a stalemate. (Planet Hulk: Gladiator Guidebook#1: Sakaar: Society - BTS) - Imperial Clerics of Fillia accused the Red King of going out of his way to eradicate the practice of the religion Saka; they further claimed that the Red King's hidden goal was to place himself as the recipient of all adulation by creating a secular society guided by a code of ethics in which service to the Empire was the greatest glory. More radical critics aruged that the Emperor was actually planning to create a new religion that named him as the one and only god. 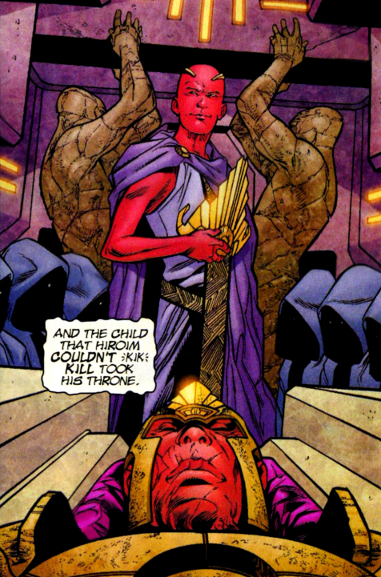 (Planet Hulk: Gladiator Guidebook#1: Sakaar: Society - BTS) - Many upper middle class Imperials started shrines and temples dedicated to the Red King, claiming his bloodline to be divine in hopes of gaining favor with the Red King. The Empire tolerated these shrines without any official comment. (Incredible Hulk III#102 (fb) - BTS) - Under orders from the Red King, Primus Vand or others broke a group of Kronans who attempted to rebel against their slave discs. (Incredible Hulk III#102 (fb) - BTS) - The Red King slew (or allowed the slaying of) the lover of Elloe Kaifi (or the lover of some other Imperial who helped in the Warbound's invasion of Crown City) was slain in the Great Arena. (Planet Hulk: Gladiator Guidebook#1: Sakaar: Wildlife: Amebid - BTS) - Presumably under order of the Red King (or, at least, with his approval), the Empire began using Amebids in its war against the Fillians, strapping the unwitting animals with explosives and directing them toward Fillian encampments in suicide missions. (Planet Hulk: Gladiator Guidebook#1: Sakaar: Geography: Independent Province of Fillia - BTS) - The Empire began to gain an advantage over the Fillians. (Incredible Hulk III#92 (fb) - BTS) - Angmo-Asan terminated his father's ruling of granting salvage to the first finders was no longer in effect, decreeing that all material passing through the Great Portal was Imperial property. (Planet Hulk: Gladiator Guidebook#1: The Imperials: Ronan Kaifi - BTS) - Presumably under orders of the Red King's agents, Ronan (and his daughter, Elloe) Kaifi, as well as Lavin Skee, were abducted from their home by a Death's Head strike force. Without formal charges, they were taken to the Maw as slaves. (Incredible Hulk III#92 - BTS) - After the Illuminati tried to banish the Hulk (Bruce Banner) in a ship to a benevolent world, the ship passed through the Great Portal (draining the Hulk's power) and crashed on Sakaar. A group of insectoid Sakaarian Natives tried to claim the ship for salvage, and as the Hulk fought them off, the Governor of Wukar and his aid confronted the group, telling them of the change in salvage policy. Despite the Hulk's resistance, the governor subdued the weakened creature. The Hulk, along with Miek of the Natives and a few other Natives, were sold at a town auction and sent to the Great Games. (Incredible Hulk III#92) - When the Hulk smashed out of his cage at the Great Games, the Red King told the Governor this was boring, as any Death's Head could rip through an old cage. After the Governor's agents had a trio of Great Devil Corkers unleashed against them, however, Angmo-Asan's interest was piqued. He was disappointed again when the Huk was swallowed whole by the creature, but was definitely intrigued after the Hulk tore his way out, splattering Angmo and the Governor with gore. The Hulk then slew the other two Great Devil Corkers, and Miek told them the Red King would now pardon them for their victory. Upon learning who was in charge, however, the Hulk leapt at the Red King, but Caiera struck him down with an energy blaster. She prepared to finish him off, but Angmo told her he would take care of this one himself. Donning his armor, Angmo stepped into the ring beside the still-smoldering Hulk. He told the Hulk he could have been pardoned and made a citizen, but "you tried to kill me instead. And for that, your emperor thanks you. Because this is going to be fun." He then tossed a sword to the Hulk and told him he had the choice of dying on his feet or on his knees. The Hulk picked up the sword and attacked, but Angmo taunted him, telling him he was the strongest one there is (as he shattered the Hulk's shield), and that if the Hulk wanted to have any chance, he had to be smarter and faster; to punctuate his point, he leapt over the Hulk and slashed his cheek with his sword. Angmo then slew the two other Natives, leading Miek to charge the Emperor, and the Hulk pulled Miek to safety when Angmo tried to slay him as well. When the Hulk attacked anew, Angmo told him he didn't learn, but then the Hulk leapt over Angmo and slashed his cheek as well. Angmo was stunned at having been struck thusly, and Caiera leapt to his defense, but as they prepared for battle, Angmo had one of his Death's Head Warguards strike down the Hulk with a blast from behind. Caiera was initially outraged that her fight had been take from her, but Angmo told her he couldn't have his Shadow upstaging him. He then announced to the crowd that he was granting this slave his life. One of the other Imperials asked if it was wise to let live someone who had bled him in front of the crowd, Angmo clarified that he was sending the Hulk to the Maw (a harsh gladiatorial training facility in the northern expanse of the Mawkaw mountains), where they were expected to perish. (Incredible Hulk III#93 (fb) - BTS) - Angmo-Asan raised the Native's tribute again. (Incredible Hulk III#93 (fb) - BTS) - When Ronan Kaifi demanded to know the charges against him, gladiator trainer Primus Vand slew him. (Incredible Hulk III#93 (fb) - BTS) - Angmo-Asan ordered that gladiators surviving the Maw be sent to oppose Wildebots that were slaughtering Imperials and Natives. (Incredible Hulk III#93 - BTS) - A group of Sakaarian Imperial dissidents (presumably the Sakaarian Democratic Insurgency) met in a cave, noting how the Emperor's war against the Fillians was getting too expensive, as it had led to raising of Native tributes and denying Natives of first pickings beneath the Great Portal. They debated approaching the Natives about an alliance, althouth their fore-fathers had tried this to no avail. After one of them revealed how the Green Scar had slashed the Red King's cheek, they decided to ally with the Green Scar in hopes of gaining the will and the power to stop the Red King. (Incredible Hulk III#93) - Informed that community representative Ronan Kaifi was continuing to protest his increase in tribute, Angmo ordered Kaifi's death, at which point his aide realized Kaifi had already been killed at the Maw by Primus Vand; Angmo seemed pleased that his will had been seemingly retroactively carried out. His aide then noted that the gladiator teams were actually making progress against the Wildebots, but that three more Native hives had been wiped out. Angmo was utterly unconcerned about the loss of Natives and re-directed the conversation to the war against the Fillians; Angmo felt that the Fillians were laughing at the Empire, and that it might be time to unleash the Spikes against them. Caiera interrupted via their communicator, asking for a word, and the Red King told her, "have as many as you like, my dear." She told him the Hulk was alive, but then had to remind him who that was; finally recognizing the description of the one who had marked him, Angmo was neither concerned that the Hulk had survived the Maw nor that his team (Hiroim, Elloe Kaifi, Korg, Miek, No-Name of the Brood, Lavin Skee) had triumphed over a Wildebot tribe in the Chaleen plains. Instead, Angmo noted that this was how the system was supposed to work...even a slave has a chance, and this would prove to the people he was fair. When Caiera added, "the people were talking," Angmo warned her that she was starting to annoy him: "What difference could one slave possibly make?" The discussion was interrupted (on Caiera's end) by the Sakaarian Democratic Insurgency, who blew a hole through the wall to the room of the Hulk's gladiatorial team's banquet in an Imperial Pleasure Cruiser asking them to help fight the Empire's oppression. (Incredible Hulk III#94 - BTS) - Feeling the Hulk was a danger to the Emperor as long as he remained in the public eye, Caiera confronted the Hulk and offered to buy him and take him to the steppes, a place of peace, where he would never have to fight again. Untrusting after his betrayal by the Illuminati, the Hulk declined her offer. (Incredible Hulk III#94) - When the Hulk's gladiatorial team returned to the Great Arena, the Red King had an Imperial dreadnought drop a Deathfire Bomb on the gladiators, but the Hulk leapt into the air and intercepted the bomb, sparing the other gladiators from the brunt of the explosion, although Lavin Skee lost an arm. The Red King then sent his Death's Head Warguard to finish off the others, and Skee perished in the ensuing struggle. Primus Vand confronted Angmo-Asan, telling him he had invested a lot of time and effort in this group and the Red King couldn't just change the rules and slaughter them. The Red King reminded Vand it was the Emperor's games and thus the Emperor's rules, and then advised Vand that no one demanded anything from the Red King and lived; he further instructed Vand to stand ready with his obedience staff, as he didn't want any of the slaves getting out of line. To punctuate Angmo-Asan's point, the Hulk then returned to the fight tearing through the Warguard, much to the crowd's roaring approval. (Incredible Hulk III#94 - BTS) - The gladiators were returned to a cell and, with the loss of Skee, declared themselves Warbound, forever loyal to each other. Meanwhile, Caiera met with an unidentified Imperial to arrange the Green Scar's defeat, and the Imperial showed her the Silver Savage (the Silver Surfer/Norrin Radd, having been weakened by traveling through the Great Portal and enslaved by an obedience disc. (Incredible Hulk III#95 - BTS) - The Red King declared a public holiday to commenorate what he believed would be the death of the Green Scar at the hands of the Silver Savage. (Incredible Hulk III#95 - BTS) - Enslaved Imperials were inspired to find Eleha'al vines growing from the spots in the Great Arena on which the Green Scar had bled. (Incredible Hulk III#95) - Looking out of his palace, which appeared to have some non-Imperial female still lying in his bed, the Red King heard the drum call announcing the holiday. Later, one of Angmo's aides confirmed that they had obtained the shuttle in which the Green Scar had arrived, further noting they had learned from its databanks that the Green Scar had been tricked into boarding it, possibly with the intent of killing him. The Red King interrupted, noting that, as the Green Scar had cut him, he should be the one who killed the Green Scar, but his aid warned that if he killed the Green Scar, he would make him a hero and that he should just let him die like a monster. After the Hulk and his Warbound defeated the Silver Savage following destroying his obedience disc, Korg demanded their freedom. Caiera informed the Red King the struggle was over, but Angmo noted it was not over yet. (Incredible Hulk III#95 - BTS) - On Angmo's order, Caiera announced that because the Green Scar had slashed the Emperor's face, he was to slay the Imperial traitor Elloe Kaifi to prove his loyalty, at which point they would be freed. When they refused, considering themselves Warbound to Elloe as Lavin Skee had served her will, Primus Vand activated their obedience discs, which would fry their brains if they continued to resist; but then the recovered Surfer destroyed the obedience discs on everyone in the Great Arena. The Warbound then broke out of the Great Arena, leading other freed slaves out with them as well. The Silver Surfer departed, but the Hulk elected to stay on Sakaar. (Incredible Hulk III#96 (fb) - BTS / Planet Hulk: Gladiator Guidebook#1: Emergency Address: The Green Scar - BTS) - Caiera -- presumably under the Red King's orders -- hunted the Warbound in the Twisted Wood. She was assisted by members of the Imperial Guard, the Governor of Wukar, and the Death's Head Warguards. (Planet Hulk: Gladiator Guidebook#1: Emergency Address: The Green Scar - BTS) - The Red King addressed an Emergency Session of the Imperial Senate with regard to the Green Scar's threat, which he claimed threatened to unravel the very fabric of their civilization. Reviewing the Green Scar's history on Sakaar, he noted that, due to the high cost of re-capturing the Green Scar, the Empire had no other choice but to assess increased tributes to finance the ongoing hunt. He concluded his address noting that he was willing to bet the Green Scar had nightmares of his impending defeat by the Empire. (Incredible Hulk III#97) - As rebellious Imperials, literally aided by the Elaha'al vines (grown from the Green Scar's blood) that inspired them, rushed Crown City, the armored Red King confronted them with his fiery sword. As a rebel cried, "May the prophet preserve us," the Red King replied, "The prophet can't help you, slave. You'd be better off praying to your king." and continued to incinerate the rebels. Another rebel called him a blasphemer, which he denounced as treason, though he "absoved" the rebel in flames. Witnessing the Emperor's wanton slaughter, one of his soldiers contacted Caiera, telling her she must return as her Emperor needed her; however, sensing an imminent attack by Natives inspired by the Green Scar, Caiera severed contact. Later, after she returned to Crown City's arena district, she was disturbed to see the Emperor killing anything that moved, rebels and Imperial troops alike. To stop the slaughter, Caiera leapt in front of him and used her Old Power to generate a shockwave that stunned them all. She told him that the rebels would bother him no more, but he told her they still bothered him just by living, and he instructed her to step aside. As she tried to plead with him, he ordered her to move now, but he was then distracted by the return of Denebo Aruc. Angmo-Asan asked him where his armor and troops were, but the distraught Denebo noted how the Hulk had fulfilled more prophecies and that he was the Sakaarson. After angrily incinerating Denebo, Angmo-Asan reiterated that he himself was the hero protector, the deliverer of the people, and the true son of Sakaar. He then ordered Caiera to destroy all pretenders to his throne. Rebels allied with the Hulk's Warbound informed the Hulk of the people rioting in the street, fighting the Emperor, and exclaiming the Hulk the Sakaarson. (Incredible Hulk III#98 (fb) - BTS) - Miek convinced the Hulk to help the rebels and Natives fight against the Red King, and the rest of the Warbound followed suit. (Incredible Hulk III#98) - When the Hulk and Caiera met in an explosive confrontation, an Imperial serving the Red King tried to communicate with the Imperial troops, questioning Caiera's status. The Red King told his aide to forget about Caiera, and asked where was the Green Scar. After the Elaha'al vines that grew from the Hulk's blood led the reporting soldier to voice that the Hulk truly was the Sakaarson, the Red King gave the order to send the Spike ship to crash in that area. The aide begged the Red King not to do this, but the Red King ordered him, and the Spikes soon swarmed over the Imperial soldiers, leaving the Hulk and Caiera united against them. (Incredible Hulk III#99) - When Caiera traveled to the city of An-Sara to warn the people to lock themselves down to protect themselves from the Spikes, the Red King spoke to her via a floating communication device, asking why she was there when he had ordered her to kill the Green Scar. When she tried to warn him of the Spikes' threat, requesting Death's Head Guards and Deathfire Bombs, he assured her they were on their way; but when she alerted him that the bombs were missing the Spikes, he revealed the Spikes were not his targets. Caiera realized his goal was to surround and trap the entire village, in order to trap the Hulk in with the Spikes. When the Spike-infected Hulk arrived, despite the Red King's orders to the contrary, Caiera used her flame gun to help burn out the Spike infections. Though the Red King tried to advise her to slay the Hulk while he protected the Imperials trapped in An-Sara, she instead joined the Hulk in fighting the Spikes. The Red King accused her of working with the enemy, but she promised that once his subjects were safe, she would kill the Hulk. Instead, he mocked her, telling her that he had released the Spikes because she couldn't kill the Hulk, and that now she and the civilians were just getting in the way. He said goodbye to her as his soldiers dropped a Deathfire bomb on her. (Incredible Hulk III#99 - BTS) - Caiera tried to shield a young Imperial child; though her Old Power protected her, the child was incinerated. Having witnessed the Red King's true, monstrous nature, she joined the Hulk's Warbound, vowing to fight by their side until they were all dead or until she had split the Red King from gullet to groin. The Hulk then spoke to one of the Red King's troops' ships, telling the Red King they were coming for him. (Incredible Hulk III#99) - Receiving the transmitted video, the Red King responded (though presumably his words were not transmitted back), "Bring it on." (Incredible Hulk III#100 (fb) - BTS) - The Red King ordered his Imperial troops to drive the Spikes forward until every rebel was dead. (Incredible Hulk III#100 - BTS) - Despite Caiera's entreaty that they join forces against the Spikes, the Imperial soldiers continued to use fiery weapons to drive the Spikes towards the Hulk, his Warbound, and the rebels. Guided by the Red King's aides, additional spike ships continued to crash-land north, east, and west of the rebels' location. Imperials drove the Spikes through forests and villages so they would build their strength before reaching the rebels. (Incredible Hulk III#101 - BTS) - As Caiera, Hiroim, and the Hulk met with the Shadow Elders, Korg, Miek, and No-Name the Brood attempted to hold back the Spikes. When the Red King's ships arrived to attack the Warbound, the Hulk (and Caiera, Hiroim, and Arch-E) returned with the Stone Starship he had taken from the Shadow Elders; Arch-E used the Stone Starship to release an electromagnetic pulse to de-power the dreadnoughts and cause them to crash. (Incredible Hulk III#101) - While the Hulk and his Warbound headed with the Stone Starship to Crown City, the Red King demanded his aides finish charging his armor; one of his people warned of the EMP they were using but felt they might be able to protect the Red King's armor. (Incredible Hulk III#101 - BTS) - While the Hulk, Caiera, and Korg met with Spike Elders; Hiroim told Elloe Kaifi to wait for the Hulk before they did anything further. However, when a group of "Imperials" met with Elloe, telling her the Red King's days were over and that it was time for a queen, she led the "Imperial" rebels to assault Crown City as they headed to the palace. (Incredible Hulk III#101) - The armored and powered-up Red King intercepted and began incinerating the rebels; he confronted Elloe, calling her the highblood traitor to the empire, and asking if she preferred incineration or incapitation. However, the Hulk then arrived with the rest of the Warbound and the Spikes (with whom he had made an alliance), and offered the Red King a third option, "Kicking your %#*." (Incredible Hulk III#102) - Though Imperial soldiers rallied to protect their emperor, the Red King struck them down with his flame sword to get them out of the way, and then launched a fiery blast at the Hulk. In response, the Hulk had Miek chem (share memories and emotions via pheromones, or something like that) all of the Warbound with the Red King, "so when I beat him to death, he'll know why." Unphased, Angmo sighed and then asked, "What do you want from me? Tears? For these slaves? For these monsters? Yes. I killed them. As is my right. As is my duty. As is my pleasure." He then struck the Hulk with his flame sword, noting with pleasure that the Hulk could still bleed, but it just made the Hulk madder and stronger, and he struck back, battering Angmo's armor and catching his flame sword in his bare hands. Pulling himself to his feet, Ango noted that he was now mad, too, as he fired a pair of missiles at the Hulk, who was unphased and punched Angmo again, shattering the armor from his right arm and head. Angmo told the Hulk he was giving him one last chane to kneel down and beg before him or he would burn every soul the Hulk had tried to save. When the Hulk refused, Angmo touched his hand to a panel, activating a weapon that cracked the planet's tectonic plates. As the Red King hovered within a protective force field, the Hulk leapt down into a chasm, reaching magma and pulling the plates back together. Astonished, Angmo nonetheless started to threaten the enraged Hulk as he leapt to the surface, and Korg hurled him at Angmo. but the Hulk punched Angmo out of Crown City into the distant plains.When "Imperials" mistook him for a dead wildebot, he shouted his name and began to order them about, but he was then assaulted by a group of Wildebots. He screamed out, but was swiftly silenced as they swarmed over him. The people in Crown City cheered the Hulk as he crushed and dropped a piece of the Red King's armor, telling them the only real monster on the planet was dead. (Skaar: Son of Hulk#8 (fb) - BTS) - A group of Imperials that had been loyal to the Red King did not surrender; instead, they enslaved a group of Natives/insectoids and hid in the valleys, waiting for the time when their master would return. (Skaar: Son of Hulk#6 (fb) - BTS) - The Wildebots took Angmo-Asan in, and they tapped into sockets used to interface with his armor; they gave him new life and new understanding as they rebuilt him as a mostly bionic cyborg. In his new form, the Red King saved the people from the fiery ruins of Crown City, healing their wounds and sharing his peace. He settled into peaceful ruling the city Okini, along with some of the people he had saved. (Skaar: Son of Hulk#6 (fb) - BTS) - The Wildebots determined that Skaar, one of the sons of the Hulk (at the time, pretty much no one realized Hiro-Kala was also the Hulk's son), sought the Old Power. They assembled a device that could grant him that power. (Skaar: Son of Hulk#6) - When Skaar, Omaka, Ol'Sahm of the Shadow People, and a group of their allies traveled to Okini, the Red King surprised them with his presence. The enraged Omaka swiftly attacked, calling him a monster, but he withstood her assault and then pinned her down to stop her while explaining how he had changed. Another "Imperial" rebel told him to let her go, which he did, while some representatives of Okini arrived, bringing them food and drink and assuring them Okini was a safe and free city in which there was a place for all of them. After revealing that they had built a device to grant Skaar the Old Power, the Red King added that the world had become so...unruly lately and that it really needed a champion, a protector. As he encouraged Skaar to go ahead, Ol'Sahm told Skaar not too touch the device. The Red King asked if this wasn't what Ol'Sahm had wanted, adding he had trained Skaar well, and now the time had come for the boy to embrace his heritage. Ol'Sahm argued that they could not trust the Red King, who was Skaar's father's enemy and the opposite of everything the Hulk stood for. One of the people of Okini discussed how the Hulk seemed a monster at first, but proved himself a hero, and then explained how the Red King had redeemed himself. The Red King encouraged them all to accept his gift, but Omaka grabbed Ol'Sahm and departed on a skimmer ship along with Kram of the Imperials. When one of the Warguard attempted to fire on the ship, the Red King stopped it, telling it to let them go. (Skaar: Son of Hulk#6 (fb) - BTS) - Omaka and her allies met with Axeman Bone, offering to join him against anyone allied with her father. Meanwhile, Skaar touched the Old Power device and began to feel its energies. (Skaar: Son of Hulk#7) -While an armored Imperial (Yenrag? ; hard to see clearly) exhorted the Red King to save the people from Skaar's Old Power, the Red King calmed him, telling him that if Skaar had wanted to kill them, he would have already drowned them in lava. Angmo-Asan asked Skaar if that wasn't right, and then explained Skaar's new feelings as the power worked through stone and earth, enabling Skaar to feel the planet like his own skin. 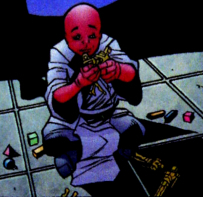 When Skaar identified an Imperial slave as the one who had carried the bomb through Crown City, the slave claimed his obedience disc had forced him to do so in service of the Red King, but the Red King responded that though he had a slave disc, he had not received any commands from his emperor; Angmo-Asan further explained that he had already been defeated by the time the bomb was set. After the Red King stated the slave had acted alone, Skaar slew him with lava. (Skaar: Son of Hulk#7 - BTS) - Skaar subsequently used the Old Power to assault Axeman Bone's base; when Bone took to the air to escape his wrath, Skaar threatened to kill Bone's daughter, Lihlia. The Silver Surfer battled Skaar and severed his connection to the Old Power, but Skaar then had the Death's Head Warguards implant the Surfer with a slave disc, preventing him from returning to the approaching Galactus. (Skaar: Son of Hulk#7) - The Red King accompanied Skaar, the enslaved Surfer,the Warguard, Brood-Native hybrids, and other allies out of Okini. (Skaar: Son of Hulk#8) - Alongside Skaar, the Red King and their allies encountered Hiro-Kala, Kram, and Old Sam, who had just freed a group of Natives/insectoids from the Red King loyalists that had enslaved them. The Red King made his presence known, and asked General Tormon if he still served his former emperor. When Tormon acknowledged that he served him forever, the Red King told him that he would then forever serve Skaar, who would sweep his realm clean of the barbarian horde; every true champion of the crown would fight by his side. When they encountered Axeman Bone's second army, Skaar had the Surfer save 13 innocents (slaves or children), while he, the Red King, the Warguard, and Brood-Native hybrids attacked and slaughtered the army. They eventually reached Bone's castle, and while Omaka emerged and battled Skaar, Axeman Bone awakened the immense dragons sleeping beneath Fillia. (Skaar: Son of Hulk#8 / (Skaar: Son of Hulk#8 (fb) - BTS) - As Skaar confronted Bone, Caiera took the form of the Hulk and attacked Skaar. (Skaar: Son of Hulk#9) - The Surfer told "the Hulk" how Skaar had enslaved him and allied with the Red King, who was approaching. Axeman Bone attempted to convince "the Hulk" to join him in killing their common enemy, the Red King, but the Red King admitted he was indeed a monster when last he and the Hulk had met, but that the Wildebots had rebuilt him, body and soul. He further added that he saw things differently now and had fought at Skaar's side, while the Axeman had devoted himself only to the slaughter of thousands and the murder of Skaar. "The Hulk" responded by ripping into the Red King's chest and tearing out a handful of wires and then shattered Bone's right forearm. "The Hulk" then insisted they both bow to their new leader, Omaka, as she had the rights by lineage as the daughter of the Red King; held an alliance with Axeman Bone, a rival would-be ruler; and protected the innocent. When Axeman argued against the Hulk's ability and right to do this, the Red King approved as the Hulk was the strongest one there is. The Red King then dropped to his knees, renounced his crown, and swore alliance to Omaka; "On penalty of death, I give up all grudges and claims, and once again make myself anew as your subject and servant. " Omaka accepted his pledge, noting she would gladly claim his life should he break it. Angmo-Asan then told Bone it was, "his turn," and after "the Hulk" noted "he" would take care of Skaar, Bone agreed, acknowledging Omaka as his queen, and advising they all flee. Before Caiera revealed her true identity, Skaar told "the Hulk" he had joined forced with the Red King and the other "monsters," because he was going to wipe the planet clean (apparently not just of the barbarians, Imperials, the Red King, and the Axeman, but of everyone on its surface). (Skaar: Son of Hulk#10) - The Red King watched alongside Omaka and Axeman Bone as the Silver Surfer condemned Skaar for refusing to let Galactus consume Sakaar, as its energies might sate Galactus for millennia. (Skaar: Son of Hulk#10 - BTS) - Caiera expelled Skaar to Earth, and she allowed the sacrifice of Sakaar to Galactus, who arrived soon after. (Skaar: Son of Hulk#11) - Caiera urged the Red King and the others to flee in the Stone Starships she had raised to escape Sakaar's destruction at the hands of Galactus. (Skaar: Son of Hulk#12/2 (fb) - BTS) - Galactus consumed Sakaar, but though he was sated and rested, Sakaar lashed out as he passed through the wormhole, awakening Galactus and causing him to hunger for more planets with the Old Power. (Skaar: Son of Hulk#13 - BTS) - The Red King was not seen amongst those in the Stone Starship who escaped Sakaar. Comments: Created by Greg Pak, Carlo Pagulayan, and Jeffrey Huet. 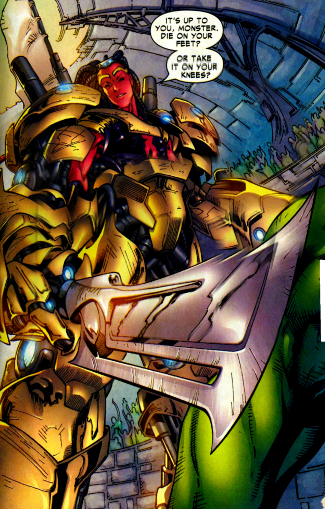 I believe the name Angmo was first revealed in Planet Hulk: Gladiator Guidebook#1, while the name Angmo-Asan was first revealed in Skaar: Son of Hulk#6. We don't know for sure that the Red King escaped Sakaar. And, if he did, where did he go? Was he behind the scenes in Son of Hulk#14-17? Did he go elsewhere to seek a new fate? I think the Modern Sakaarian Calendar and chronology in the Planet Hulk: Gladiator Guidebook should be considered questionable. While the book was written from Greg Pak's original notes and approved by Pak and editorial, subsequent stories have contradicted those dates and even the order of events to some extent. Even within the Guidebook, which was an impressive work with a ton of great data, there were numerous contradictions. In-story, we already have notes that records of the Father Emperor's life were destroyed during the War of Empires and the Spike War...and that information was pieced together in the New Encyclopedia and established as the official history of Imperial Sakaar. So, some of the information may be erroneous, some from confusion, and some of it perhaps propaganda, altered to make the Father Emperor and/or the Red King look better. Additionally, most in-comic references to the Father Emperor are second-hand accounts given by beings whose motivations in imparting the correct information are questionable, such as Miek (Tales of the Warbound). Regardless dates are included in this profile when listed and not found to be contradictory. Generally, when something notes something as a number of years ago, that's from the stories...when a specific date is given, that 's from the Modern Sakaarian Calendar. The Modern Sakaarian Calendar notes Angmo-Asan to have been born in 519 post, and, while a date is not given, Hiroim was sent to kill him when he doesn't look like he could be more than 2-4 years old. According to Miek's account (Miek is crazy and hostile, BTW) in WWH Aftersmash: Warbound#2/2 noted that after Hiroim refused to kill Angmo-Asan, he allegedly wandered the desert in exile for 20 years, until the Father Emperor's death; however, the Modern Sakaarian Calendar gives the Father Emperor's death as 552 post. Angmo-Asan allegedly led his warriors out to battle the Spikes when he was 16...per the Modern Sakaarian Calendar notation of his birthdate in 519 post, that would make this 535 post. However, it is after this that he enslaved Caiera, which it notes to have occurred in 533 post. As his enslavement of Caiera involved the use of Death's Head Warguards, who arrived on Sakaar after the opening of the Great Portal, which is noted to have happened in 536. Dates in the Guidebook reference Angmo-Asan claiming Caiera before the opening of the Great Portal, but Caiera's account notes that Death's Head Warguards were present at that attack, which would place their bonding as after the portal, since the Warguards emerged from the Portal's first opening.